Kate, I just downloaded the sample for Moth Flight’s Vision.. So it looks like this Gooseberry- pale yellow tabby she-cat yew tail- cream and brown tom…. So, is this just an error. Are Gooseberry and Yew Tail different cats? I think I know who could possibly be second Command to Clear Sky: Nettle, because he’s known him for a long time, he helped him test Red and he’s kinda been advising him back and forth. For Tall Shadow, I think she’ll pick Holly since Holly is like a boss lady. She’s often times seen talking with Tall Shadow too. As for River Ripple, he will probably pick Night, Dew or Moss Tail. I see River to be mates with Night really and I rather see Moss Tail as deputy since River would pick him to show confidence in former rogues. 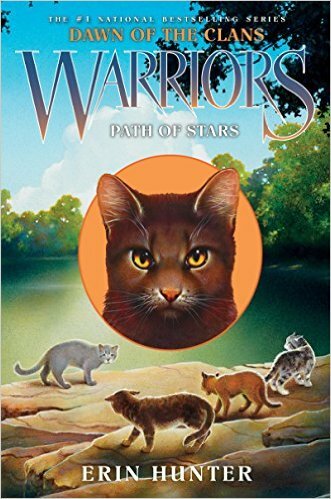 Holly moves to Windclan with Jagged Peak and her kits in MFV, so I don’t think she’ll become Shadowclan’s next leader. YOU ARE CORRECT. WHAT ARE THERE CAPS? Kate are Thunder’s kits, Apple Blossom, Goose Berry, Yew Tail and Snail Shell? Also it doesn’t state Flower Foot’s main pelt color. Just that she has tan stripes. Also are Apple Blossom and Snail She’ll, Thunder and Violet Dawn’s kits or will we have to W.AS? I just read the prologue for Moth Flight’s Vision, and OMG! I recognized that scene anywhere Kate. It was from the first ever Warriors book you wrote. Into the Wild! And lol at Moth Flight’s confusion for when Bluestar (whom she thought was dead) woke up. Well…leaders technically don’t have nine lives yet. I can’t wait to see how this plays out. Also, are Apple Blossom and Snail Shell, Thunder and Violet Dawn’s kits? Also, I am now firmly convinced that Moth Flight has ADD. Easily distracted, mind wandering even when you’re honestly trying to concentrate, being yelled at for it even though you really were trying, getting distracted by something interesting and shiny that other people don’t see as important… she totally fits as someone with ADD. It would explain a lot.